Are you considering learning how to knit? To help point your needles in the right direction, we’ve put together an easy-to-follow video tutorial to talk you through the basics. The Knitting Network’s Freddie Patmore starts with a lesson in tying a slipknot – an essential first step of any knitting pattern project. She will then demonstrate the thumb and cable methods of casting on. While both are fairly simple to master, they have different qualities. The thumb method – also known as long tail cast on – is good for beginners and puts less strain on your hands and wrists. Guessing the length of yarn you need, however, can be tricky. On the other hand, the cable cast on method is wonderful if the pattern you are working on requires a neat and springy edge. Regardless of what method you choose to use, you can sometimes end up with a cast on edge that’s a little loose. Simply work with a smaller needle and swap up to a larger size when you starting knitting. Freddie will then guide you through knit and purl stitch and explain how to complete a project by casting off. 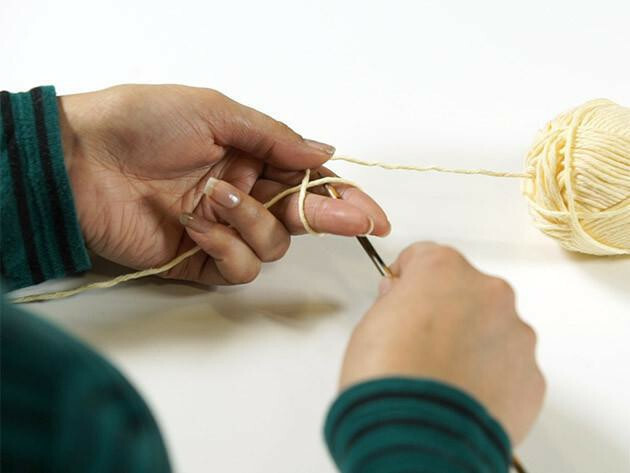 Knowing how to cast off is vital for anyone keen to master the art of knitting as it’s the way you stop your stitches - and hard work - from unravelling once complete. Follow her tips and you'll soon have your first piece of knitting. Although it might have holes and look a little uneven, you'll quickly improve the more you practice.